The Cinema are the phoenixes of the Marion rock scene, born from the ashes of many popular local bands. The Cinema has come through a tangled path of networking, bands breaking up, and love of each others music. I will now do my best to unweave the tangled web of bands that came before the cinema that have carved the path to where we now stand with the band. So the roots of The Cinema started with a band called Spider Fighter in 1996. Spider Fighter was Pop/Punk band which tour with The Atari’s, and Slowrode. That band consisted of three current Cinema members and one other member. Cody Smith, Tyson Smith, Ben Joliff all of The Cinema, and Rich Alexander made up SF. Spider Fighter eventually ran its course around 2001 the band took its second change to a band called Second String Hero. They released on EP on Righteye records, the ep was a split with a band called Middle Name Danger, called “The birthplace of rock”. If your are taking notes you will notice MND comes up later in the story. 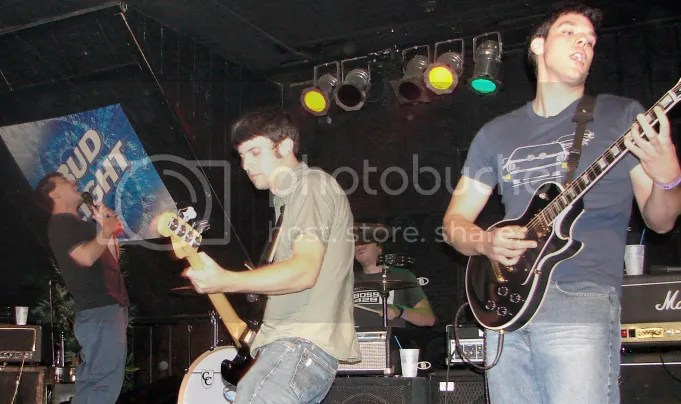 SSH lasted until about 2003 and toured with bands like Brand New and Rocky Horsemen. So in early 2003 I am told The Cinema is formed. It consisted of the afore mentioned members of SF and SSH (Cody, Tyson, Ben) plus a couple new members. Josh the guitar player from Middle Name Danger was picked, and Carlos from a band called Join’R which played in Marion’s skate park and the members of the cinema were huge fans of. The Cinema did do a tour in 03 without Carlos on vocals, Tyson Smith sang on that tour. So in spring 2004 came an untitled EP which was recorded and released. After that they tour later in 2004 and in 2005 began work on there new CD, Transcontinental. Also on their west coast tour in 04 they met with Volcom Records but were passed over for a band called Valiant 4 instead. Transcontinental is on Secret Society Records. So now comes the second part of the path of The Cinema all the side bands that these guys are a huge part of. I could go into depth about all of them but it would involve a family tree being drawn, so Ill just touch on the major ones. Koufax is a Pop Jazz infusion band from Toledo that Ben and Cody are a part of as touring musicians. Cody, Tyson and Ben also dabbled with a side project after SSH and before The Cinema called Mariner. 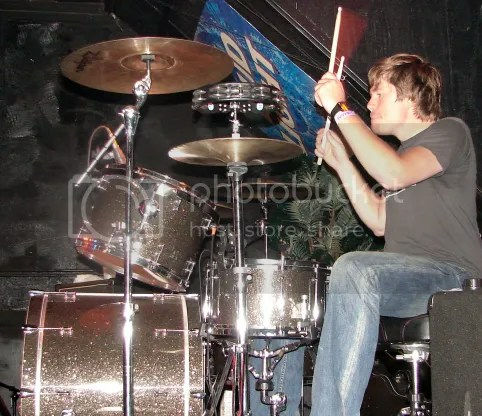 Cody then also drummed for a band called The Arsons Daughter which was a Punk-core band, after TAD broke up it was continued minus one member to a band called Admiral. Now comes the band that is most tied to The Cinema, Vicious Whiskey. Vicious Whiskey consists of Cody Smith (is anyone counting how many bands does this guy drum for again), Ricky French, and Justin Glass. VW was formed in 2004 and recorded a demo in July of that year. Now in the Spring of 2006 they have taken the next step and put together an EP called Red Edges which is available on their myspace. VW almost always plays with The Cinema around here in local shows and is defiantly the most prevalent of Cod’s Side Projects. VW is a kind of different sound than The Cinema, VW contains more melodic rock with some elements of folk and country. SO know the real reason your reading this other than to find out the history of The Cinema, to get insight into the band its self and it’s amazing music. The Cinema have come along way through a lot, as you have just read, to form what they think is the best mixture and formula for their music right now. “It’s nice to play with my ‘brothers’ and then the best guitar player I know in Josh and the best singer I know in Carlos” Cody Smith told me. I also asked where the name came from and I was told that it pretty much stems from the entire band being movie fans. I asked Cody and Ben kind of about there bands philosophy. They both told me “Everyone in The Cinema is The Cinema equally”. “We started this as best friends. and we are just trying to write music we love” Cody threw in. “ You being in other bands just motivates us to make our own music and ourselves better, kind of opens our ears to new ideas and styles” Cody mentioned. “With the new record coming out we don’t know what to expect or when the next step is coming, but when it does its exciting. We just hope people enjoy our new record” Cody Smith said about the release of their upcoming CD. “I guess we just want people to hear The Cinema and take it for what it is, a rock band” added Cody. The band also mentioned a lot of their influences range for many different things from bands like Peter Gabriel, Pink Floyd, Genesis, and Janes Addiction for Carlos to Indie Dance Instrumentals for Tyson, yet the others like a lot of bands like Cave In, Mock Orange, and Super Drag. A few songs to check out by The Cinema are Vertical Hole, A list of Things, and Strick on Box. aforementioned bands at their myspaces. The Cinema would like to thank their parents for all there love help and support. And Vicious Whiskey would like to give a special thanks to Patrick Carrie of Limbeck and Spacey Casey Prestwood of Drag the River/Hot Rod Curcuit.